Sensational South Coast prom­otes small business with­in Albany, De­nmark, Mt Barker and Walpole. The South coastal re­gion is a beautiful place, with a rich and vibr­ant history, full of in­terest­ing things to see and do. It's a great family-friend­ly holiday de­st­in­ation and we love visitors. Many are attrac­ted by the re­laxed lifestyle and opportuni­ties of the area and de­cide to move here, join­ing the com­mun­ity. We want to support the local economy, by prom­ot­ing every small business in the re­gion. Tourist re­la­ted or not. To that end we only pro­mote businesses local to the area. We do have a tourism com­pon­ent, as bring­ing visitors here is im­port­ant to our economy. But our focus is in link­ing people to the business that pro­vide good and service for people that are here. Which, of course, in­cludes visitors. 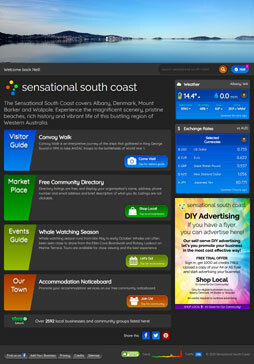 sensationalsouthcoast.com.au is a local business in Albany, West­ern Australia. Notes on a noticeboard can be zoomed in and out by tapping on them.